Heather Phillipson’s The Age of Love draws you in with your ears before you even get to it. The thumping beat of electronic dance music reverberates through the walls of the vast Level 4 gallery space, capturing your curiosity and luring you in. Yet upon entry, the first thing visible is merely the back of several tall wooden boards. The whole exhibition is audible, its flashing lights in sight, but the main body of work remains obscured. Cattle gates skirt the edges of the room, shepherding visitors around the periphery of the exhibition, allowing only tantalising glimpses of the madness that awaits. But when you reach the back of the room, the floor finally becomes your playground. Decked out with flashing lights, a 90s trance track also titled The Age of Love and fast-flashing images of animals on screens, the gallery is a sort of apocalyptic barnyard rave. It is difficult to focus on any one screen at a given time, as images on each one loop and reappear on other screens. It is easy to find yourself staring at multiple screens at once, trying to figure out the pattern and logic behind what appears where, when. Cut together with explosively colourful patterns and cosmic backgrounds, the images of the animals have a meme-like quality to them. They fit in with a wave of memes which hark back to 90s graphics. Amidst the destruction that surrounds the screens, they seem to commemorate a better, brighter, pre-apocalyptic time. Heather Phillipson, The Age of Love. 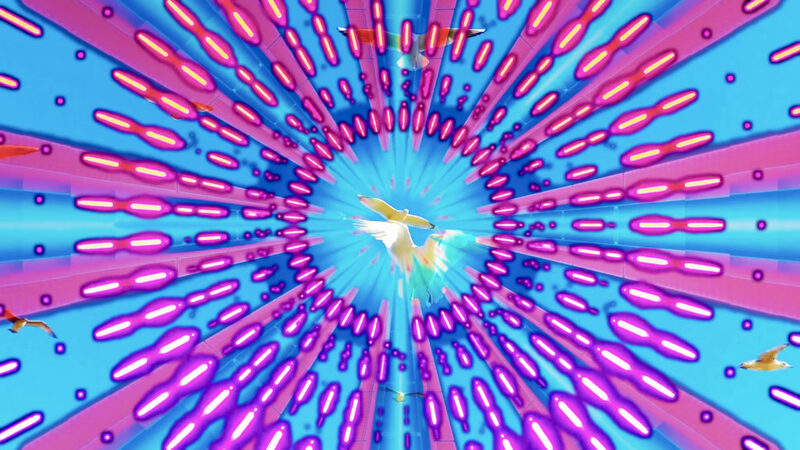 Still from multi-screen video, 2018. Courtesy the artist. These smaller screens are joined by a projection of a giant cat with bright green eyes, which is placed next to an old silo with speakers attached to it, booming out music. Alongside this is what looks like the ruins of a huge foot from an archaic statue. Needless to say, the peculiar sights and multi-sensory experience are hugely absorbing. From the rocks under your feet to the lights above your head, the exhibition is fully immersive. So immersive, that it is easy to overlook the screen in the nook at the back of the room. Positioned at an angle, with a pile of wood chippings directly opposite, it almost seems as if the wood chippings are sat in front of the screen, watching. The screen plays clips of grass overplayed with spoken word and music. Videos of sped-up grass in the breeze make each blade look like they themselves are dancing along to the music: attendees of this psychedelic gallery rave. Phillipson’s work has featured increasingly apocalyptic undertones in the past two years, with the artist herself describing 2016 as ‘the year in which I lost my sense of humour’. Keeping in line with what she perceives as the ‘global catastrophes’ that have occurred in recent years, Phillipson’s work is overwhelmingly chaotic. But in the midst of this is something celebratory. The music and images enrapture visitors, transporting them to this optimistic, alternate reality that Phillipson has conjured. It is a radical and rebellious party, triumphantly raving on in the face of post-Trump, post-Brexit doom and gloom. 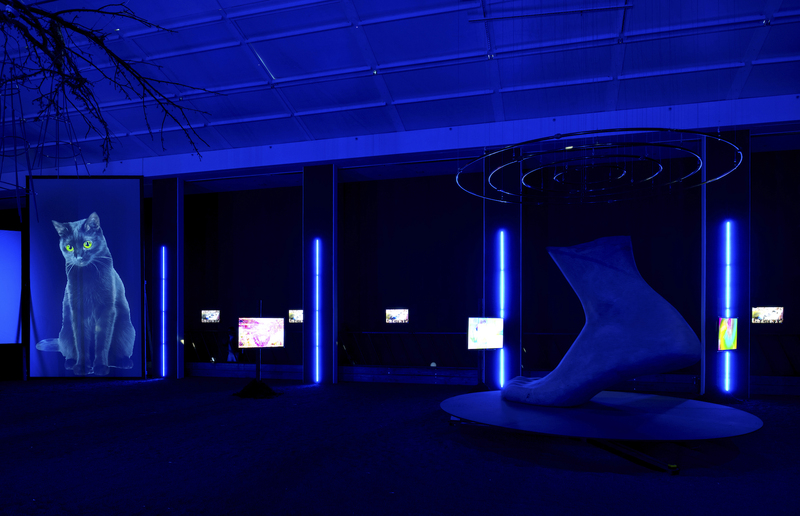 Heather Phillipson: The Age of Love, BALTIC Centre for Contemporary Art, Gateshead, 19 October 2018 – 31 March 2019. Carys Rose Thomas is a writer and student based in Newcastle upon Tyne.